The new constitutional draft, which will be voted on at a national referendum in a matter of weeks, sees the adoption of a number of checks and balances related to presidential power that were not present in the previous charter. Following the ouster of president Mohamed Morsi in July -- accused by many political opponents of exceeding his powers -- the 2012 constitution was suspended, to be redrafted by a new committee. The new draft, the product of several months of work by a fifty-member panel, enshrines a number of innovative measures that limit the power of the president. These include mechanisms for parliament to withdraw confidence from or even vote to impeach the president. The president can dissolve parliament after calling for a public referendum (Article 137) while two thirds of parliament can call for a public referendum to end the president's rule and organise early presidential elections (Article 161). The president also has the right to object to laws issued by parliament and has the right to promulgate laws with the approval of two thirds of parliament (Articles 122 and 123). While the president can appoint a prime minister chosen from within the party that wins a majority in parliament (Article 146), parliament can withdraw confidence from the prime minister chosen by the president (Article 133). Despite these principles, several political forces and parties believe the draft constitution gives the president more power than the parliament. “We wanted a strong parliament and a strong independent prime minister, not a premier that works in the shadow of the president,” Nadar Bakkar, a leading member of the Salafist Nour Party, told Ahram Online. “We preferred [to have] a true semi-presidential system that is closer to the parliamentary system,” he added. Bakkar said the semi-presidential system mentioned in the draft constitution is far from what the Salafist party aimed for. Unlike, the Nour Party, the liberal Free Egyptians Party believes that the semi-presidential system adopted in the draft constitution is the best system in terms of facing the hardships of Egypt’s current situation. Parliament in the new draft constitution is made of one chamber, known as the House of Representatives. The House of Representatives is to be made up of 450 members elected by the public for five years. The president, however, has the right to appoint five percent of house members, according to Article 102. The main role of the House of Representatives, as mentioned in Article 101, is legislative, as well as "to approve the State’s general policies as well as public economic, cultural and social policies, and the public budget.” The article also states that parliament has a supervisory role relative to the executive authority. Despite that the draft constitution sets out in detail the form and role of parliament, it left interim President Adly Mansour to decide on one crucial detail: the electoral system that would elect the body. The president is to choose between a party list system, a candidacy system (for individuals), or a mixed system encompassing both. In 2011, Egypt adopted a mixed system. Nader Bakkar described the individual candidacy system as "killing parties" and said he was in favour of a mixed system giving party lists 75 percent of parliament and individual candidacy the remaining 25 percent. “Do you want real political life in Egypt or not? Real political life means strong parties in a healthy political atmosphere,” Bakkar said. “You need to encourage the growth of those parties, and the party list system will help building these parties while giving less well known parties the opportunity to grow,” he added. “The individual candidacy system opens the door to money being used for political ends in the elections,” the leading Salafist figure added. Liberal Ahmed Khairy also believes that the party list system is the best for Egypt. “We said several times since the parliamentary elections in 2011 that we want a party list system in order to reinforce political parties in Egypt,” Khairy said. “There should be representation for the parties and this won’t happen except through the list system,” he added. Nevertheless, some support the individual candidacy system. Among them are the Rebel (Tamarod) Campaign and the Nasserite Popular Current movement. Advocates of the individual candidacy system say the system would prevent Islamist parties and movements, like the Muslim Brotherhood, from dominating parliament. On political parties themselves, the draft constitution is different from the 2012 constitution in one crucial respect -- it explicitly prohibits political activities or parties based on religion (Article 74). The 2012 constitution only prohibited political activities based on gender, racial and religious discrimination. This clear prohibition is considered to be a blow to Islamist parties, such as the Nour Party, which participated in the drafting of the constitution, and Morsi's Muslim Brotherhood, now facing a severe crackdown by the authorities. Non-Islamist parties welcomed the move, but parties like Nour had another view. “This article affects Islamists who work in politics. It is as if this article says they are not allowed to work in politics anymore,” Bakkar told Ahram Online. He added that from a legal point of view his party’s platform and bylaws did not discriminate between citizens based on religion. Human rights lawyer Negad El-Borai stated earlier this week that the article banning religious-based parties was useless since the principles of Islamic Sharia were still the main source of legislation, according to Article 2 of the draft constitution. Accordingly, the future of Islamist political parties is not determined. The draft constitution also favours administrative, financial and economic decentralisation of the country’s governorates and local councils (Articles 165 and 167). According to the draft, members of local councils are elected (Article 180), while it is left to the law to decide whether or not governors and heads of local units in governorates should be elected or appointed. The local council electoral system is also left to be determined by the law. Khairy told Ahram Online he was not sure if the security situation in Egypt’s governorates would allow for organising local elections. “The local councils have been the subject of a huge debate since Mubarak. We are speaking of nearly 54,000 seats. The democratic rule says that local councils should be elected. 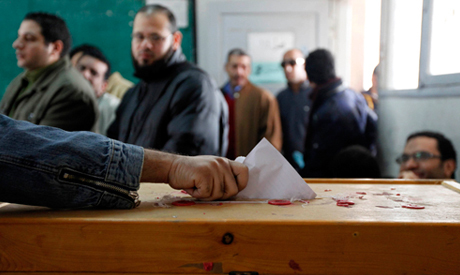 But can we hold elections now for local councils in Egypt?“ Khairy asked. “The local councils law has been under discussion for three years now and members are still being appointed temporarily, which is useless. Local councils are the true schools for upcoming members of parliament, like in a real democracy. But we are still waiting for the legislation,” he added. the constitution allows the president to be impeached BUT no touch to defense minister. Something is wrong there as who holds the power.